This is an American acacia, one of a worldwide 1,300 species. Acacias are in the mimosa subfamily of the Fabaceae, and recent cladistic studies have shown the genus to be not monophyletic, so work is being done that may break up the genus into at least five genera. 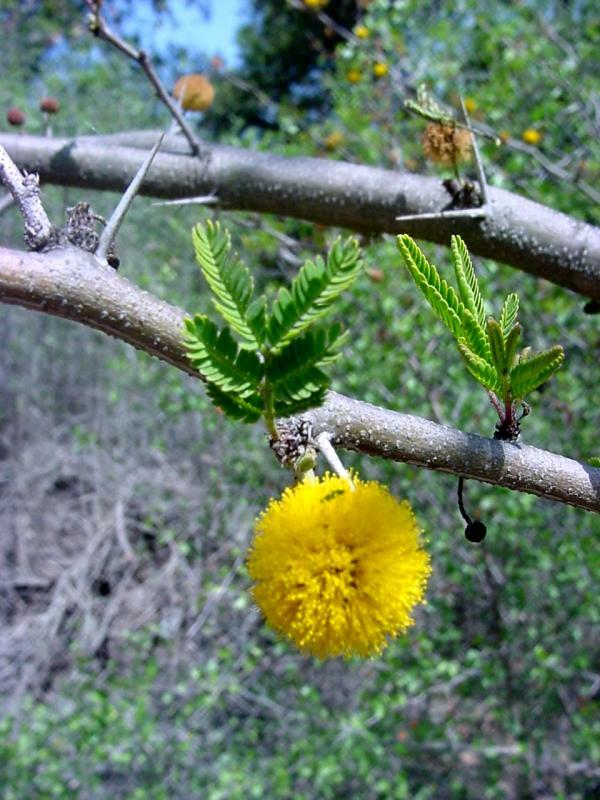 Sweet acacia is native from west Florida to southern Texas and Arizona, Mexico and tropical America, and may be found on dry slopes in chaparral near San Diego. It is a shrub or small tree rarely exceeding 10' in height with straight stipular spines that become whitish as they age. The leaves are 2-pinnate with 2-5 pairs of primary leaflets, and 8-15 pairs of overlapping oblong secondary leaflets. The golden yellow to dull orange flowers are usually 1-3 heads per axil. As the name indicates, the flowers are very fragrant, and are cultivated in some countries as a source of perfume. The plump curved fruits are indehiscent, narrowed between the seeds, and 3" to 6" in length. 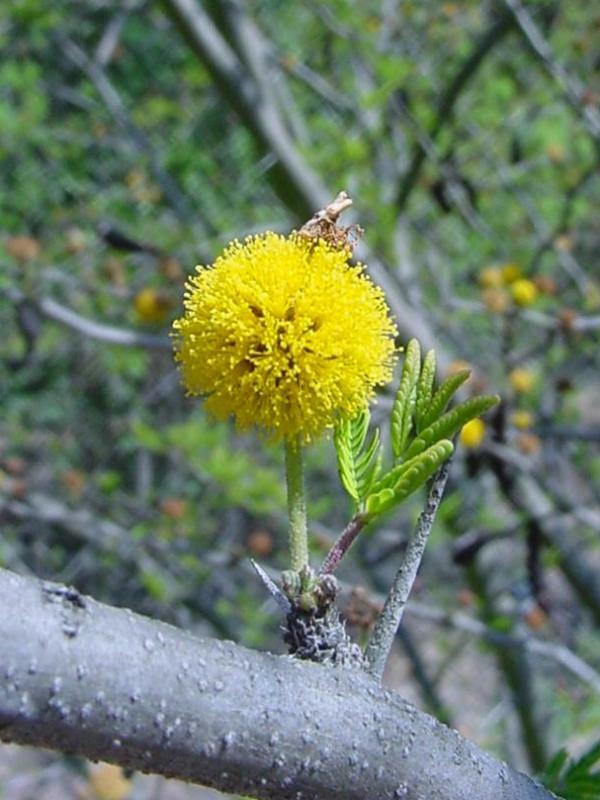 Sweet acacia is often a troublesome weed, blooming from January to March. Click here for Latin name derivations: 1) Vachellia 2) farnesiana. 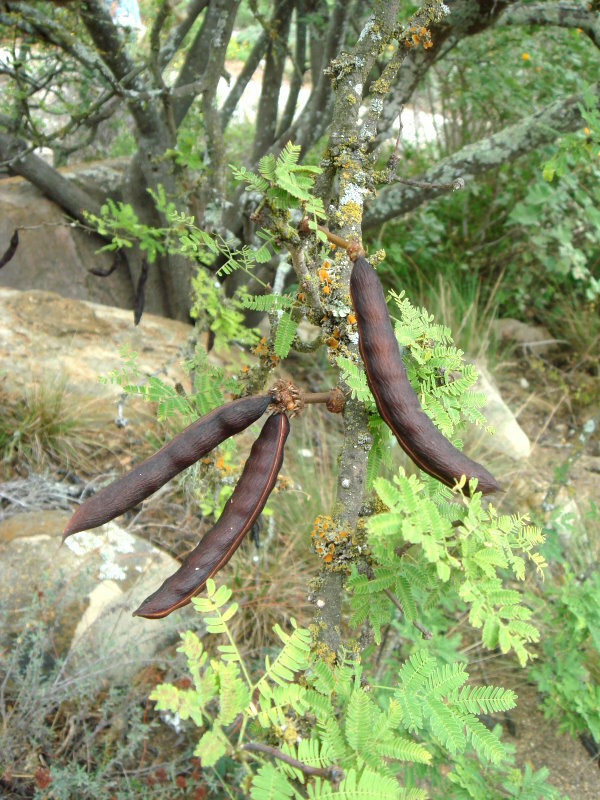 Formerly Acacia farnesiana var. farnesiana.